Foxy Bingo has been around since June 2005 and is firmly planted as one of the biggest names in online bingo. Foxy Bingo have advertised well taking prime time spots on national television as well as teaming up with celebrities such as Katie Price (Jordan) and shows such as the Jeremy Kyle show. Foxy Bingo is one of the most heavily advertised of the Globalcom powered sites and it makes the most of its newly founded traffic by being heavy on the promotions in lieu of the sometimes shaky software. However it’s obvious that a lot of money has gone into other aspects of the site and where Foxy really shines is within the extra features and community based emphasis outside of bingo itself. While the provided gaming software isn’t enough to stop a player from sticking around at Foxy Bingo it certainly isn’t as good as other internet bingo offerings. Globalcom is known within the industry for being one of the worst platforms in online bingo but Foxy Bingo has done a fair enough job making the site relatively easy to navigate and cleaning up the game aesthetics for users. The tickets look a lot better than similar sites and the main page is functional even if the colour scheme is so pink and purple that it can be hard on the eyes. It takes a bit more work to find your way around Foxy Bingo than some of its competitors but the layout isn’t beyond redemption. There are a good number of promotions at Foxy Bingo including the sign-up incentive described below. The VIP program is called VIR (Very Important Roomie) at Foxy Bingo and functions about the same as other loyalty set-ups but with the extra perk of cash-back bonuses which go as high as 15% return. Certain days and happy hours offer an increased number of bingo points for playing and jackpots regularly reach large amounts compared to the industry standards. 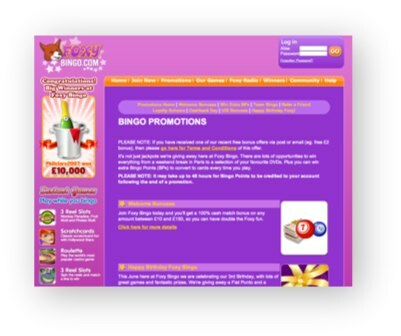 An affiliate program rewards the referring user 5,000 bingo points which is a nice bonus as well. 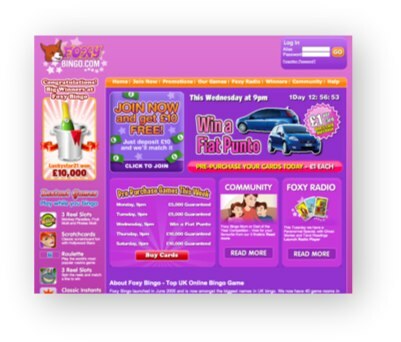 Community is a central aspect of Foxy Bingo and there are quite a number of incentives embedded within the service to attract a loyal fan base. The site apparently caters to female players (if one couldn’t tell from the leisure-suit wearing Foxy himself on television advertisements) and obviously cares a lot about fostering a sense of friendship among the players. Aside from a decent chat feature, Foxy also encourages setting up a fully filled profile and provides horoscopes and even a radio station. There is a content-rich community section on the main page as well which showcases player stories, Foxy Bingo outings, up to date player lingo and winner stories. Security is decent although players looking for a quick, free game just to try out the site will be disappointed as sign-up requires credit card information right off the bat. The good news is that this is offset by a sign-up bonus which offers free betting funds at the equivalent of £10. Foxy Bingo makes its users deposit a minimum of £10 to take advantage of the one hundred percent match-up for the first transaction (and they can have as much as £150 deposited for the offer) which is a bit of a drawback but decent enough for those players who are set on staying at the site. All in all, Foxy Bingo is a sub-par client at its foundation but has enough strength to warrant a user base which is enticed by what it does do well. Those who are looking for a client with a strong core will most likely be disappointed with their choice but those players who are drawn to the demographic Foxy Bingo shoots for will come away impressed by the community features and the friendly nature of fellow bingo enthusiasts. Foxy Bingo are part of the Globalcom network and therefore utilise the Globalcom Bingo Software. Foxy Bingo runs a web based application and the only requirement is that at least Flash Version 8 be installed in the browser of your choice. This means that Foxy Bingo will work fine in browsers such as Microsoft Internet Explorer, Firefox, and Safari. We have also tested Foxy Bingo in Windows, Mac OS X, and Linux and we are happy to say that it works across all platforms. Foxy Bingo have both a telephone support number 0845 050 2291 that is manned from 1200 to 2000 Monday to Friday only. They also have a contact form on their website that sends support an email. Again, this is only manned from 1200 to 2000 Monday to Friday. So, you are not going to get any support on a weekend at Foxy Bingo. The following deposit and withdrawal options are avalable at Foxy Bingo.